Since more than four hundred years the Sabri Brothers have been the most famous musicians family in the tradition of Qawwali music. 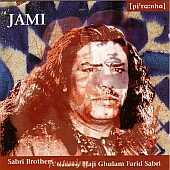 This is their second release on Piranha and named after the famous Persian poet and mystic - is dedicated to the late Haji Ghulam Farid Sabri, who died an untimely death in 1994. This record therefore becomes a memorial not only to the Persian poet but also to the Pakistani Qawwali, the devotional music of the Sufis, the mystics of Islam, carrying the divine message which stirs the heart to seek God.